Concrete has long been used for structures. Today, almost every building, house, and roads are made of concrete. Although it goes to show that it is a durable and reliable material, consistent use and exposure to climatic changes can cause damage. One such damage is efflorescence. 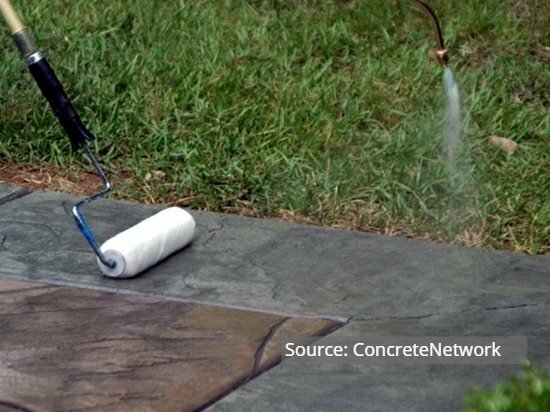 This big word may seem unfamiliar but have you seen that white powder appearing on top of your concrete? Sometimes it looks like white salt, too. That is concrete efflorescence. Let’s get to know a little more about it. 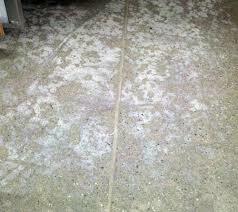 When white powdery deposits form on the surface of a hard and cured concrete slab, that is called efflorescence. This occurs on both sealed and unsealed concrete. It looks like salt because it consists of salt along with some mineral byproducts. When water vapor migrates to the surface, it takes salts and mineral byproducts along with it. This can easily be removed and washed away from the surface but if there is too much of it, an acidic cleaner or a sandblaster can be used to get rid of it. What are the Effects on Decorative Concrete? Decorative concrete surfaces that have been sealed get the worst type of efflorescence. The effects, however, will depend on the type of concrete sealer used. Acrylic Sealer – This type of sealer allows water vapor to pass through it. However, the salt and minerals it takes with it stay beneath the sealer, causing the surface to look discolored. There is no way to remove the salts but you could cover it up with concrete stain. Urethane or Epoxy Sealers – This type of sealer does not allow anything to pass through it. What happens is that the water vapor, along with the salt and minerals, stay trapped beneath the sealer. This causes the sealer to delaminate and separate from the concrete, thus, increasing the risk for the concrete to weaken. Experienced contractors have developed several methods to prevent or at least minimize efflorescence. Metakaolin or Class-F fly ash is added to the concrete mix to keep salts from rising up with the water vapor. A vapor barrier, usually a thin plastic sheet, is installed before the concrete is poured. Urethane and epoxy sealers are immediately applied on the slab as soon as it hardens. This will keep water from entering the slab. Efflorescence may affect the appearance of a concrete surface but it is easily preventable. Just make sure to hire a pro to install your concrete so that the occurrence of efflorescence and other types of concrete issues are kept to a minimum.